« Chancel Choir Rehearsal @ 6:00 p.m.
Save the date and join us for an evening of family fun, food and fellowship! 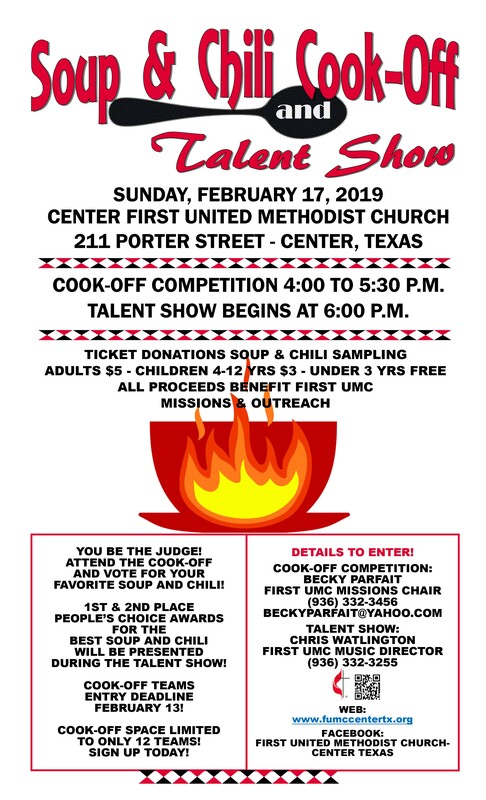 The First United Methodist Church (UMC) of Center Missions and Outreach Committee will host their inaugural Soup and Chili Cook-off competition on Sun., Feb. 17, 2019 beginning at 4:00 p.m. until 5:30 p.m. at the church Fellowship Hall located at 211 Porter Street. The First UMC annual Talent Show will begin at 6:00 p.m. following the cook-off. The Soup and Chili Cook-off competition is open to individuals of all ages and local organizations, but all must be amateur cooks only. The cook-off is limited to 12 teams with a maximum of 4 members per team and advance registration is required by Wednesday, February 13, 2019. A non-refundable entry fee of $10.00 secures the team’s cook-off space. Cook-off teams will have the opportunity to compete in both the Soup or Chili categories. Cook-off ticket donations are $5.00 for adults, $3.00 for youth ages 4-12 and children age 3 and under are free. Tickets will be available at the door. The event begins at 4:00 p.m. for competition food sampling. Adult ticket holders will receive 5 tickets to vote for their favorite Soup and/or Chili and youth ages 4-12 will receive 3 voting tickets. Additional voting tickets will be available at the event for $1.00 each. First and Second Place People’s Choice awards will be presented in both Soup and Chili categories and winners will be announced during the Talent Show.